This is where it’s at people! This week is officially BURGER week here on KC! Can I say that my mouth has been watering and my taste buds extremely happy the last few weeks as I have gotten ready! First up, before I can let you have at it with all those outrageous burger recipes, I thought it might be important to share some crucial “Burger Bites” or tips on how to make the perfect burger. So check out the article below that I wrote for meal planning/recipe site Food on the Table. And in case you can’t wait until tomorrow to see the first bodacious burger recipe of the week, I took the liberty to link to some drool worthy burger recipes from around the web at the bottom of this article. Summer brings late nights, days at the pool, and of course firing up the grill. America’s favorite food, hamburgers, are a grilling staple! While burgers and outdoor barbeques go together, well like, burgers and fries, mastering the perfect burger requires some useful knowledge. Below are seven grill master tips to achieve the ultimate burger. • The meat: Most burger enthusiasts claim that grinding your own meat is the only way to go, but for many this is not an option. However, purchasing good quality ground meat is important. Generic ground beef can be a combination of several cuts of beef, which tends to be higher in fat and will make a greasy burger. Choosing ground sirloin, at 15% fat, is the best burger option. 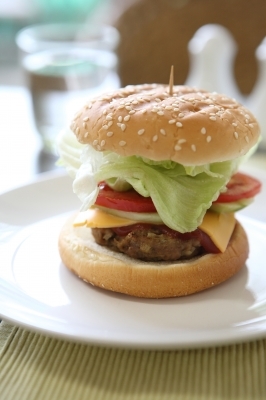 • Don’t over work the meat: When adding seasonings, avoid over mixing the meat; which will cause burgers to be tough. • Chill the meat: Before forming the patties, chill the meat for 20-30 minutes. This step is crucial, since warm fat will easily melt while shaping the patties, thus causing a dry burger. • Form the perfect patty: After the meat has rested and chilled, divide each pound of beef into four equal patties. Wet hands with cold water and shape beef into ¾-inch thick patties. While shaping the patties, gently form a small dimple in the center. This prevents the burger from ‘puffing up’ while it cooks, making for an even burger. • Season: Salt and pepper will bring out the natural flavors of the beef. However, do not season with salt until after forming the patties and right before cooking. Salt dissolves muscle proteins and if added too early will make the burger tough. • Grill it up: Proper grilling techniques are crucial to cooking the perfect burger. Make sure the grill is extremely hot. Never press down on the burger patties, as this releases the natural juices in the burger. Let the burger cook for five minutes before flipping. Flipping only once prevents the burger from falling apart and sticking to the grill. • Perfectly melted cheese: After flipping, let the burger cook for three minutes and then top with cheese while the burger is still on the grill. With grilling season here, and your new found burger knowledge, impress your friends at your next barbeque by making the perfect burger! Lookin’ for some hearty burger recipes to try this summer? Look no further, I’ve got you covered!